CSA stands for Community Supported Agriculture and is an opportunity for customers to develop a close relationship with an individual farm while gaining a share in the farm’s harvest. Community Supported Agriculture or CSA is a partnership between consumers and farmers in which members buy shares of the farm’s harvest and enjoy regular allotments of food throughout the growing season. For farmers, this provides much needed cash flow for the beginning of the season, as well as a ready market and community of supporters. Shareholders join in the risks of the growing season but reap the benefits of the harvest. Each CSA farm has its own pricing structure, disbursement schedule, and some have work requirements. Signups for CSA shares begin in early winter by directly contacting the farm. Do you like to eat lots of fresh vegetables? Are you interested in trying new things? Do you cook at home at least 4 times a week? What vegetables (and fruits) are to be expected? How many weeks is the share for? When and where are shares picked up or delivered? What type of payment schedule is expected? What happens if a pick-up is missed? Does the CSA offer extra add-ons (eggs, dairy, meat, seafood, flowers)? Is there a volunteer work requirement? How long has the CSA been running? Please contact farms directly for more information. 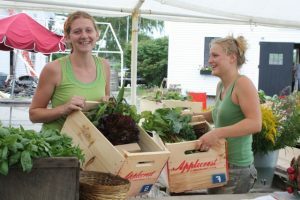 A complete list of all farms offering CSA shares is also available through Seacoast Harvest, including descriptions of each of their offerings and programs. Applecrest Farm Orchards: Built on a foundation of mutual support, Applecrest’s FarmShare creates a direct relationship between you and our farm. In exchange for your commitment to buy a share in our farm’s bounty, we in turn dedicate ourselves to you. We’re your family farmer, planting, cultivating and harvesting exceptional produce expressly for your table. The “share” represents our commitment, taking form as a weekly delivered box abundant with super fresh, hand-picked fruits and veggies. Brasen Hill Farm: Customizable and flexible, we offer a monthly CSA that works for you, with no bulk payment. This includes the convenience of ordering right from your computer, tablet, or phone. At our pickup locations, your box is packed for you to take home, or you can choose home delivery and have your CSA share delivered right to your house. Clyde Farm: Certified Organic Eggs and Chickens, Flowers grown using organic practices. Offered in conjunction with Stout Oak Farm Certified Organic vegetable shares. Weekly pick-ups for each option; Saturdays from 9am-12pm or Tuesdays from 2-6pm. Heron Pond Farm: We have designed our share keeping you our best customer min mind! We allow the ultimate freedom of choice, no shares are pre-boxed and there is no list to follow. We let you know what fruits and vegetables are available and you choose the items you prefer. We offer two sizes of shares: a partial share for $400 and a full share for $600. We have three pickup locations: at the farm in South Hampton NH, and host homes in Portsmouth NH and Dover NH. Hurd Farm: Each of our CSA shares include a different selection of cuts each month. You may get cuts like bacon, sausage links, ground beef, steaks, a whole chicken, pork chops, etc. Our Summer CSA includes a fresh, all natural Thanksgiving turkey. Kellie Brook Farm: You chose, free style CSA. $200 share with an 8% match. $400 share with a 10% match. $600 share with a 12% match. You choose the amount you want to invest and you choose what to buy and when to buy it! New England Fishmongers: we are a group of jig fishermen who operate the F/V Finlander and sell our fish directly to consumers and restaurants. We sell the catch from our boat as well as other fishermen and harvesters. Orange Circle Farm: Our 19 week CSA program offers convenient, pre-packed vegetable shares from June through mid-October. We offer two share sizes: Full-$550 and Small-$360 along with an option to add flowers to your share. Our produce is grown without the use of any organic or non-organic chemicals! Phil’s Farm: Phil’s Farm CSA offers both full and half shares of veggies, herbs and flowers from June 6th to October 17th. Full share equates to $30 worth of food and half share equates to $15 each week. Riverside Farm: CSA members get to choose which CSA items they want and how much they want anytime during our normal business hours, 7 days a week 9am to 6pm. Everything we sell at the Farm Stand, perishable or nonperishable, is included. CSA runs from Mid April to October 31st. Sandy Hill Farm: Organically grown fruits, vegetables, mushrooms, flowers and herbs. Pickups in Eliot or free delivery to home! Short Creek Farm: We offer a Pasture-Raised Pork CSA year-round in which members choose their pick-up month and get their share in a single bulk distribution. We also offer add-on shares to vegetable CSA programs run by Heron Pond Farm and Stout Oak Farm. These shares are distributed weekly. Sioris Family Farm: We offer meat CSA. Pork, chicken, turkey, pies and bread. We also offer jam, jelly and pickles. Stout Oak Farm: Certified Organic, solar powered CSA farm! CSA Options include: Weekly Vegetable Shares, Weekly Greens Boxes, and (new!) Localvore Shares. We collaborate with Clyde Farm to offer Flower Shares, organic Chicken Shares, and organic Egg Shares, as well as Heritage Pork Shares form Short Creek Farm. Pick up at our Farm Store in Brentwood. We also offer flexible debit-style shares known as Farm Store Credit Memberships. Two Toad Farm: Vegetables, Meat, Eggs, Seedlings CSA with three options: reserve your own, choose your own, or grow your own. Wake Robin Farm: We strive to provide the highest quality (not to mention tastiest!) produce we can. You will enjoy many tried and true heirloom varieties, along with some of the most exciting new hybrids. We send out weekly emails on Sunday evenings detailing the items in the share for the coming week. We also include recipes and storage instructions. For more information on CSAs, read our blog posts: How CSA’s Save Local Farms (and the World) and February is CSA Month (All about CSAs).